You are currently browsing the Gluten Free For Good blog archives for October, 2011. Update: The winner of a package of this awesome bread mix is Sherri. Lucky girl! Who loves the golden-brown, crusty edges of a freshly baked loaf of bread? Who prefers the soft, warm, sweet smelling center? That part is good, but nothing like the crumbly texture and delicate taste of the crust. Which do you crave? The crust or center? I’m curious, so let’s take a vote. Leave your answer in the comment section below. You might be the lucky winner of a package of Montana Gluten-Free PrOatina Toasted Oat Bread Mix. There’s no right or wrong answer, although people do seem to have a definite preference for one or the other. I have a serious weakness for the crust, but I know others who are hopelessly addicted to the center. The winner will be randomly chosen by my 5 year old neighbor. It’s worth a comment; this bread is awesome. Before I launch into this post, I have a disclosure to make. While I love my Montana Gluten-Free farmer friends, I don’t get paid to say nice things about them. I order my toasted oat bread mix online (check here) and pay full price like everyone else. The package I’ll be sending the winner was part of my recently purchased half-case of bread mix. My intention is simply to support the farmers who are doing it right. We get to vote with our forks (or bread pans in this case) and I vote for healthy, sustainable, gluten-free food choices. This is literally a “grass roots” movement and the more we know about what’s in our food supply and where it comes from, the better off we are. Yes, I love this bread. Yes, I love these farmers. But here’s the deal. I have to be mindful about how much bread I eat. Baked goods are an occasional treat, so if I’m going to eat bread, I don’t want to waste my time, money, or my calories on the low grade stuff. Aside from being the best loaf of gluten-free (or not gluten-free) bread EVER, this toasted oat flour is a good source of protein and fiber and even contains some calcium and iron. And here’s the kicker about the crust, which is absolutely divine on this bread. Check out that photo above. I made this loaf yesterday. Does that crust look incredible or what? My weakness is the end piece—still warm from the oven, slathered with real butter. Enough so that it drips down my chin with the first bite. Slurp. Excuse me. I need to do a taste test. I’ll be back shortly. I have to make sure I’m not exaggerating. You know, for the sake of accurate reporting. Okay, just as I thought. No exaggeration. It’s that good. Back to the science behind the crust. I’m not sure how this translates to gluten-free oat bread, but a group of researchers in Germany found that the crust of a conventional bread mixture contained a unique, crust-only antioxidant that didn’t exist in the original flour. This health-promoting compound was eight times more abundant in the crust than in the rest of the bread. Pronyl-lysine is the high-powered antioxidant. It magically appears during the baking process. Magically as in a chemical reaction between certain amino acids and sugar in the presence of heat. A Maillard style love affair. An auspicious pairing that several studies have found increases the level of specific enzymes that are protective against cancer. How cool is that? Cancer fighting bread crust! Luckily I’m already smitten with the crust. No need to force myself to increase my pronyl-lysine intake. So, what is it? Crust or center? Be honest. Leave your answer below. Who knows? You might be eating your own loaf of this bread soon. Peace, love and toasted oat bread crusts! 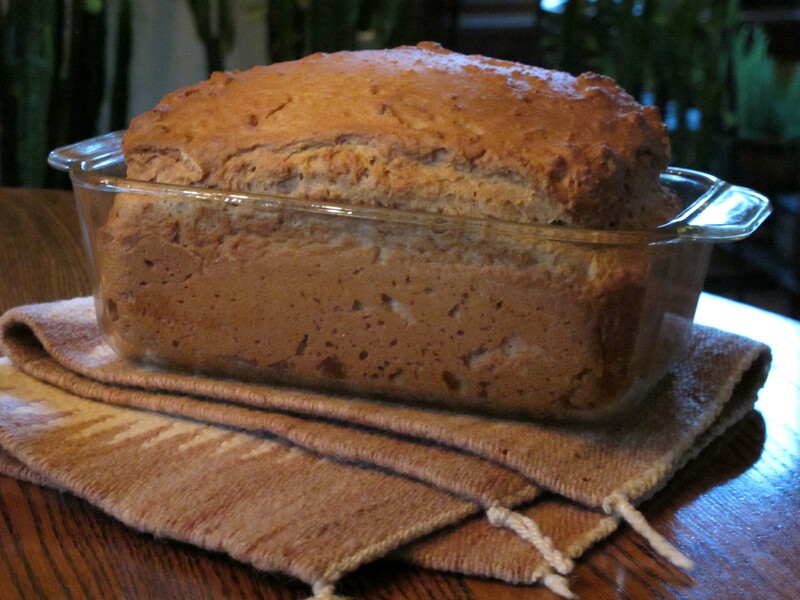 Cook’s Notes: I made the above loaf in the oven. No kneading necessary. This is my favorite way to make this bread. It’s easy and not terribly time-consuming. The crust comes out perfect. I’ve also made it in my old bread machine, which does NOT have a GF setting. GF bread doesn’t need to be kneaded and I can’t avoid that setting on my old machine, so it goes through the kneading cycle. The bread still comes out tasting great, it just doesn’t have this beautiful crust on it. My advice–make it in the oven or in a bread machine with a no knead setting. No matter how you do it, it’s a dynamite loaf of bread. Which is it? The joy of cooking, or the joy of overeating. I’m sure you’ve heard the news. Americans are eating more and moving less, which adds up to rising rates of obesity and diabetes. According to results from a 2009 study, 38 states had adult obesity rates above 25 percent. Eight states had rates above 30 percent. In 1991, no state had an obesity rate above 20 percent. In 1980, the national average of obese adults was 15 percent. Colorado is currently the only state with rates under 20 percent. Although that looks good comparatively, our rates are rising as well. We’re simply the caboose on a fast-moving train going the wrong direction. During the same year (2009), adult diabetes rates increased in 19 states. The Center for Disease Control (CDC) estimates that 25.6 million American adults, 20 years or older, have diabetes. That’s 11.3 percent of people in that age group. That’s a lot of people. If this trend continues, the CDC estimates that as many as 1 in 3 American adults will have diabetes by 2050. The risks associated with diabetes are serious, but it’s also possible to mitigate the complications through lifestyle changes. In fact, there’s evidence that type 2 diabetes can be totally reversed. It’s not easy and for some people it’s far more complicated than this, but in general, it’s a fairly straight-forward prescription. Eat less, choose whole foods, exercise more. Which brings me back to the point of this blog post. Eat less. Over the past 70 years, we’ve slowly decided we need (want) more calories. The words super-size me seem most suited to the fast food industry, but according to two creative researchers, that’s not the case. Bigger servings have even crept into such classics as The Joy of Cooking. A recent study published in the Annals of Internal Medicine found that calorie density and serving sizes have not only increased in away-from-home foods, but in home cooking as well. To determine if there was a parallel, the researchers used 70 year’s worth of recipes from 7 editions of The Joy of Cooking as a longitudinal gauge. 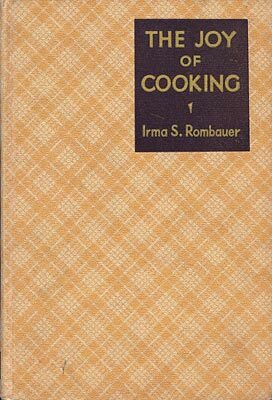 It’s a classic cookbook and a perfect one to study as it’s been updated every 10 years since 1936. To make a long and rather convoluted story short, calories increased by 63 percent per serving. Changes in ingredients and serving sizes reflect the spike in calories. Bottom line? If a recipe says serves 4, don’t believe it. They really mean, serves 6. Peace, love and smaller portions.